The Regional Universities Forum for Capacity Building in Agriculture (RUFORUM), a consortium of 66 universities operating in 26 African countries across the African continent is pleased to announce Seven (7) Staff Exchange opportunities for 2017 Academic year at the Lilongwe University of Agriculture and Natural Resources. The goal of the fellowships is to provide for opportunities for academics from outside Malawi to enhance faculty teaching, research and collaboration at LUANAR. 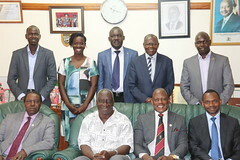 Particularly, for this call, Academic staff from RUFORUM member universities in West Africa and others from Eastern Central and Southern Africa will undertake visits to Lilongwe University of Agriculture and Natural Resources (LUANAR) and offer services such as teaching, graduate theses supervision, serving as external examiners or engaging in joint research. Applications are invited from qualified permanent teaching faculty staff who are employed at any RUFORUM member universities. Women are especially encouraged to participate in the Programme. Accommodation and modest honorarium (living expenses) provided by LUANAR – the host institution. The staff exchanges duration are planned for a period of 2 weeks beginning of October 2017 which will coincide with the RUFORUM AGM week in Malawi (26 -28th October, 2017). As such, the successful applicants might be expected to attend the AGM to share their experiences under this arrangement. When offered a travel fellowship a recommendation/ release letter from the University Management allowing you to go for the exchange programme will be required. All applications should be sent by email to secretariat@ruforum.org with copy to s.chindime@ruforum.org and indicate in the subject line “Staff Exchange – LUANAR”. The deadline for applications is 30th June 2017.